Oh 2013, where have you gone? I have tried and tested a number of new products, made a few repeat purchases and finally found an evening skincare routine which i love. I'm not one to wear a lot of makeup during the day, or at night for that matter, but i absolutely love taking the time to look after my skin. A healthy, glowing complection can (i promise) be achieved through regular exercise, a balanced diet and by investing in the time to really take care of your skin. MURAD Hydro-Dynamic Ultimate Moisture for Eyes - A luxuriously light hydrating eye cream which achieves maximum hydration without leaving eye area heavy with excess product. The eye area is very delicate so requires careful application and regular attention. Apply eye cream by gently patting the cream evenly to the under the eye and to the brow bone using your ring finger. Where possible try avoid rubbing the cream into the skin surrounding the eyes. £57.00 BUY NOW Quote FESTIVE20 at checkout to receive 20% off. 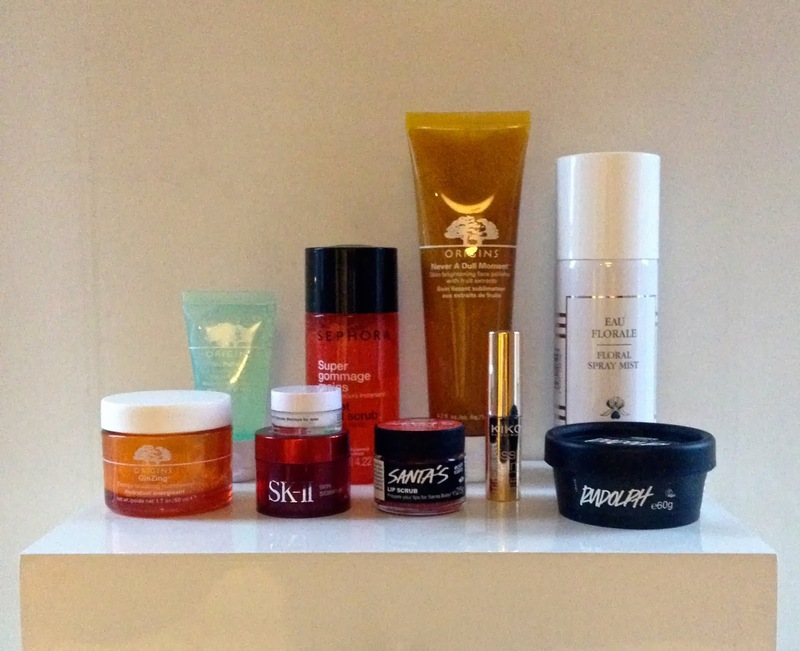 So that's a roundup of all my beauty favourites for 2013. What are your favourites? and lastly thank you for all your support over Pomegranate and Coffee's first few months! That LUSH Santa's lip scrub seems to be amazing, I want to buy it! Amazing products, haven't tried many of them but I will! These are so amazing. I can't wait to try some of the origins suggestions. I've got a pretty reliable skin care routine, but I'm always looking for masks and eye creams to wake me up!! Lovely post! Thank you for sharing all of that information about these products. Happy new year dear! I wish you joy and happiness. EVERYONE's been loving the lush lip scrub thing! I've tried their originals, and although they're overpriced (I mean all it is is some sugar and food colouring!) they ARE incredible! So much Origins appearing on everyone's 2013 round up posts I really need to get more involved with their range of fab products. PS Love your blog name! This post is so good! I'll definitely be trying some of the products! Love LUSH products...I have not tried the Rudolph mask but will do so next holiday season. My favorite product from them is Ocean Salt! I love the sound of the Rudolph face mask, just a shame it was limited edition. Great picks. I am always looking for new products to try. Right now I am loving Sesha skin care. I love Never a Dull Moment crazy amounts. It was a spur of the moment buy and probably my best purchase last year.